These cupcakes were an order for a teacher who was celebrating her 70th birthday on Sunday. 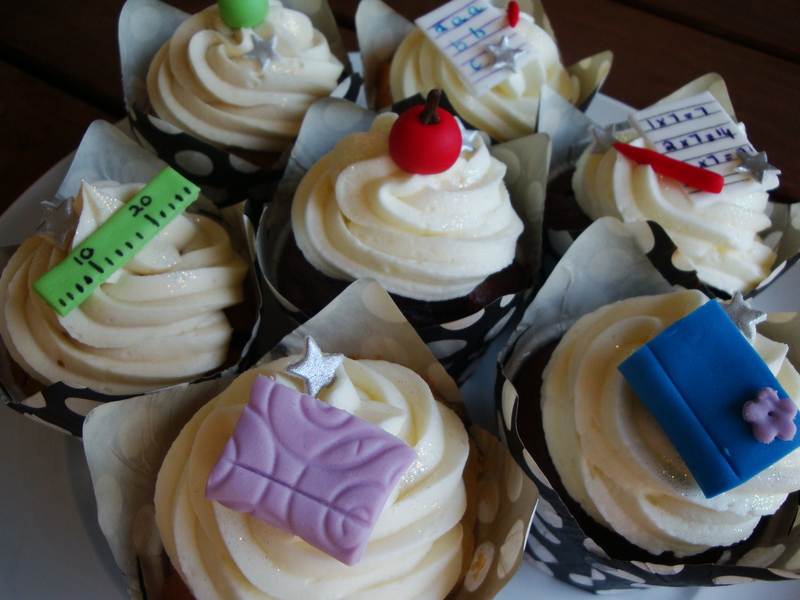 I made red and green apples, books, rulers & notepaper sugarpaste decorations for these cupcakes to suit the theme. Shaunagh surprised me with 4 different Nicoletta food colouring markers she had bought at the Good Food and Wine Show on Friday so I used these to mark the lines and to do the writing on the notepapers. These markers make it so much easier to write on sugarpaste. I had been painting my writing using edible colouring and a paint brush – so thanks Shaunagh these are a breeze to use. I hope the cupcakes went down well for your friend’s birthday! The cup cakes look great, well done! You can also use Americolor food writers they come in 10 different colours and work very well on sugarpaste. They are available at most baking supply shops in SA. Thanks Sharon, it is great to know there are so many products available to make decorating sugarpaste so much easier. As always Lisa, your cupcakes were such a success. So clever!